Life is filled with reasons to gather together and share good food and good times. 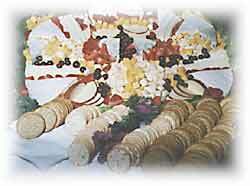 Whether you are planning a large reception or an intimate dinner party, it's important to have a detail oriented caterer. We can help all with all aspects of your party planning so when you party starts you have nothing to do but enjoy your guest. These are the hardest parties to cost because there are so many different appetizers to chose from, at such differing ingredients, and labor cost. 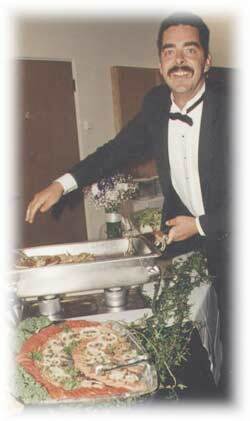 Simpler, or more extravagant menu’s w/ Pasta stations or Flambé` stations can be arranged. Buffets or Passed. The preparation is always eye-catching and delicious. ***Baby vegetables w/ Orange Zest butter *** Add $ 1.50/per. Pastas: Alfredo, Pesto, Herb butter, spinach tomato cream, etc. * Seafood styles: Salmon , Mahi, Lemon herb, Pico de gallo, picatta, Almond butter, Cajun. Lamb: Herb crusted loin w/ raspberry puree, Spring Lamb rack w/ Mint Jelly. Pork Tenderloin: Roasted garlic cream, Honey dijon basted. Seafood: Sea bass, Salmon, Halibut, etc. affordable prices. I look forward to working with you. * Tax, Gratuity, Servers and rentals not included/On-site chef and server charges apply.